Porsches love curves. But, sometimes, especially in the past, Porsche 911 drivers did not! Those older rear engined 911s behaved "different" than other cars. Some folks ran out of talent. Thus, 911 Turbos in a tree within the first week of ownership. Modern Porsches are more "normal" by comparison. But that doesn't mean there is not a curve to worry about. That curve is "the learning curve" that every driver should climb, but few do. Believe it or not (c'mon, how can you not see it every time you drive!) most everybody is actually Unconsciously Incompetent at driving. They think they know what they are doing. But in fact, they don't even know the simplest things. Like how to drive smoothly. Or look ahead. Or brake really hard. Or what the cornering limits really are for their car. Sad to say, just because you have your favorite Porsche transporting you does not alter this fact. That is why if you have not done a high performance driving education event (HPDE for short), you may not even know there is a learning curve out there that you are missing. Drove right through it! In an HPDE, as a student with an instructor's help, you begin to realize there is indeed a learning curve there. That there is in fact a whole world of things that might be good to know and that will help not only on the track, but in every moment you are driving. 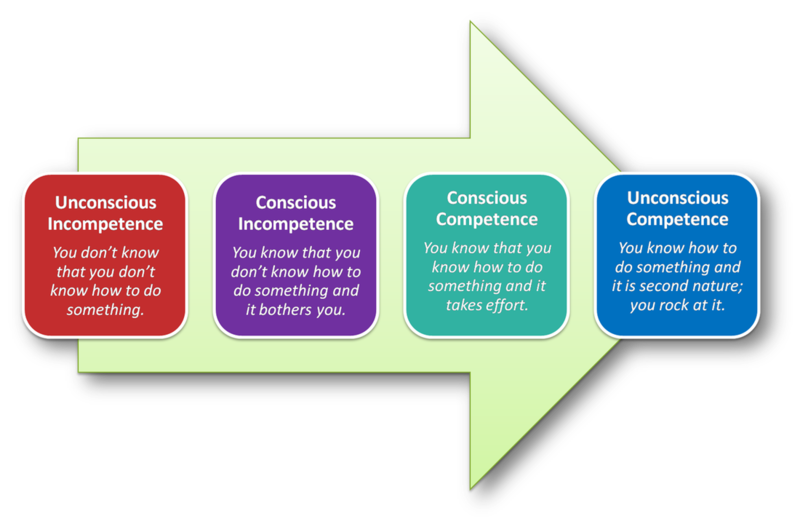 You begin to climb the learning curve iteratively and at your own pace in a manner similar to the graphic above. And that is a fun thing to do! Because it is not easy, but you can see the improvements as they come. So, please come to our tech session on April 2 at Southpointe Porsche "So, you REALLY want to DRIVE?" to find about HPDE's and what they are all about. As hopefully, you all know, on First Saturday, April 2, at Southpointe Porsche, we will be having a Tech Session called "So, you REALLY want to DRIVE?" Basically everything you ever wanted to know about getting started with High Performance Driving Events (HPDE) but were afraid to ask. So all of you folks who have not done an HPDE before, this is a good way to learn what it is all about. During the Tech Sesion, we will have technician from Southpointe Porsche show us the Tech Inspection process. This is something that every HPDE participant needs to have done on their car before an event. I am looking for a volunteer for this. If you are planning on doing an HPDE in early April, you can get it done on April 2. Anybody interested, please drop me a line at bob@bobeusner.us Thanks! The Zone 2 PCA HPDE event is this coming weekend, March 18 - 20, at VIR. Sorry - if you have not already registered, then you're out of luck for that. But, touring laps will be held around lunch time each day. Anybody (once they sign VIR and PCA waivers) can participate in those. No passing, controlled speed and no helmets needed! So, if you want to get a small taste and catch up with your fellow 'Caners at the track, please plan to drive up!